Yesterday, while reading the newspaper, I saw an article that caught my eye: “Vegetables can be the star at cookout.” Every Wednesday, both of the newspapers we have delivered to our home have a “food” section. This one comes from the Milwaukee Journal Sentinel. It stood out to me because David and I had just talked about trying to grill more vegetables. Grilling shouldn’t always be about meat, we said. And that is exactly what article is about! We tried one of the recipes today and it was good, though we would grill it a bit longer the next time we make it. And while I modified the recipe slightly, it is still the basic recipe. Whether you are an omnivore, vegetarian or vegan: Good food is good food. Give this recipe a try. Cut the vegetables, pineapple and tofu to size and marinate with the reserved sauce for at least 3 hours. 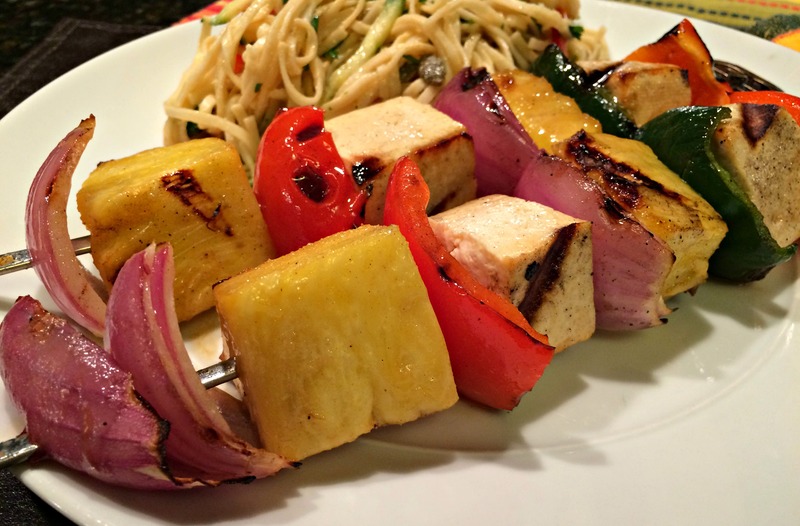 When you are ready to grill, place the vegetables, pineapple and tofu on your skewers in an order you like. If you are using wooden skewers, soak them in water for at least 30 minutes. 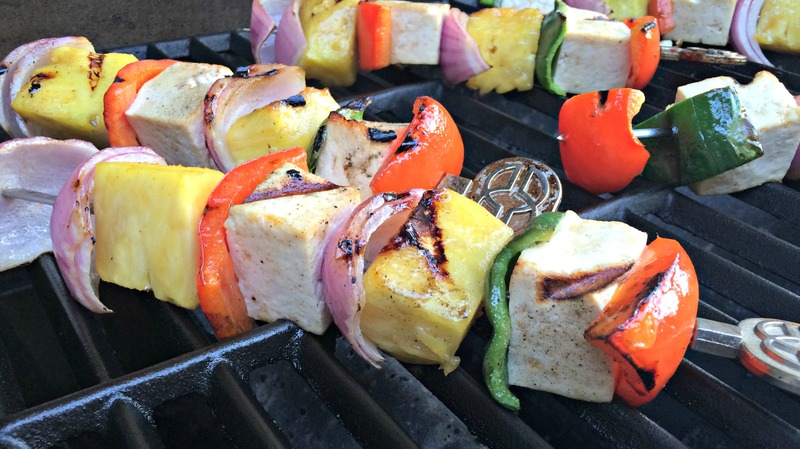 When ready to grill, heat your grill to high and sear the skewers until done to your taste. Serve the remaining marinade as a sauce for the skewers. NOTE: This makes a lot of marinade, so you can cut back on the amount or save it for your next grilling adventure. Kabobs should be a food group, period. Coconut milk in the marinade- never thought of that before! And I’m thinking pineapple juice AND lime juice. I almost always press my tofu so it can absorb the marinade better. This is getting a trial soon. Yum! The noodles look great, too.